With springs produce coming soon I have been trying to clear my freezer of things that I froze last spring and summer to make some room for more. On top of my list of things to finish were the plethora of roasted red peppers. When the roasted red peppers were at their peak last year I got a big basket and roasted them, placed them individually into ziplock bags (with the charred skin still on) and tossed them into the freezer. They keep really well that way and you just thaw them out, pinch off the skin and you are good to go. While I was pulling a few of them out of the freezer I was wondering what to do with them and my eyes wandered and came to rest on a package of frozen spinach which immediatly made me think of spanakorizo, a Greek spinach rice) . My next thought of course was that of a roasted red pepper version! I wanted to keep things simple and continue with the Greek flavour theme which meant that I wanted at least one fresh herb and oregano sounded like the way to go. With that, I pretty much had my recipe though, I could not resist finishing it off with some feta. This is another one of those dishes where after a bit of up front work, you can pretty much just sit back and let it simmer away, unattended until it is done which makes it a great side dish. 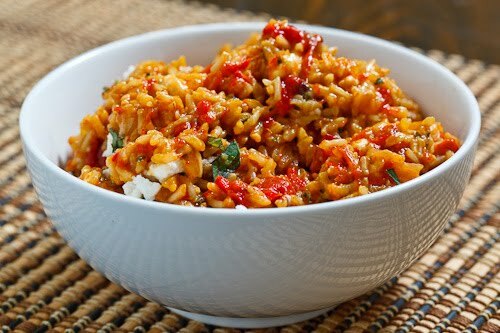 The roasted red pepper rice with feta turned out really well! It was nice and light and fluffy and full of the roasted red pepper and oregano flavours which are so good together. The feta had just started to melt into the rice making it nice and creamy and spread its salty flavour even more. I imagine that a risotto version of this rice would also work well. Add the roasted red pepper and oregano and season with salt and pepper. Add the rice and broth and bring to a boil. Reduce the heat and simmer, covered, until the rice is cooked, about 20 minutes (40 minutes for brown rice). Remove from the heat and mix in the feta. Roasted red peppers and feta are two of my most favorite ingredients so this is bound to be a smashing success! I can't wait to try it. This is a great idea! Love the colour of the red pepper into the rice as well. i love having cheese in my rice. never thought of using feta. thanks for this one kevin–i love this idea. When you froze your roasted red peppers, did you leave the seeds in and stem on? I'm trying to go through my freezer too! Wow this looks top. Thanks! I made a spanakorizo just two weeks ago and it was rather lack luster. Now THIS, Kevin, looks amazing. I'll be having this soon, my friend. Thanks for the tip about keeping roasted red peppers in the freezer – I didn't know that would work! what a lovely, colorful dish! Your dishes are always that way. I love how you made a dish out of what you had in the freezer. I need to do the same thing so that I can make more room for the ice cream canister haha. This is the best recipe rice ever, delicious and so creamy. This is one of those dishes that is so simple you know it has to be delicious. This is a great side dish for a variety of meats, especially chicken or fish. Great idea. All you food looks so great! I can't wait to try this one out. Oh how I love the roasted peppers/feta combo. Delicious. This is a great spring side dish, indeed! This is my kind of dish – I love roasted red peppers and feta together! Great tip on freezing them individually too! Kevin, the roasted peppers survived a year in the freezer? I thought the point was to freeze summer ingredients and use during the winter. How on Earth did you keep them that long without their getting freezer burn? And cooked peppers are rather delicate. I'm very confused about this. What a beautiful and delicious sounding recipe! Very ingenious. Do you think that sweet red peppers would be okay with this dish, or would it lack something without the "roasting" quality? I just love the combinations here Kevin. I actually found this recipe as it was posted on foodgawker… sooo glad I discovered that you had an entire blog's worth of deliciousness. I cannot stress to you just how much I loved roasted red peppers, and I think you do them proud by the looks of this dish! I'm gonna give it a whirl and post the recipe on my blog, with props to you and your blog of course. Suzee: I removed the seeds and the stem but left the skin on when I froze the red peppers. The skin pinches off easily after they thaw. Jessy: I think that roasting the sweet red bell peppers adds a ton of flavour to this dish and it only takes a few minutes in the oven under broil to roast them. Loving the sound of this rice!! I made this last night and even my picky eaters loved it. It's now in my regular side dish repertoire. I added some chopped cilantro at the end with the feta. Side dish heaven. Thanks Kevin! Yum would love this rice! Amazing!!! I love feta and red peppers, and they are easily accessible for me living in Egypt, one of the key things I look for when trying new recipes. I have just started a blog myself, on food and writing and travel, and the international variety of your recipes is very inspirational! Oh my goodness, I made this tonight for my lunch/dinner tomorrow, and all I have to say is YUM! I used a variety of peppers, not just red, and parmesan instead of feta (I adore feta, but I didn't have any on hand). I love having a healthy, tasty meal! I made this tonight, with freshly roasted red/yellow peppers and white rice. It was superb! I also think this dish would be delicious even without the feta, or with any other kind of cheese that you'd like… yummy 🙂 Thanks! I hope my rice would be like this everyday! Complete and delicious. Everything is in there. I substituted Quinoa for the rice (1 & 1/2 cups) and it was an amazing entree! Thanks for another great recipe! Interesting? I suppose cheese and pepper go together on a Pizza but not sure about cheese and rice? Will have to try! I love this kind of food. Really healthy foods for sure. And thank you for the ingredients that is posted here. I've started to prepare this soon for my wife.